RIP3-dependent necrosis—or necroptosis— is a form of programmed cell-death that is at the pathogenesis of a constantly expanding list of diseases. A fast-growing body of literature also highlights new fundamental mechanisms by which RIP3 and necroptosis are causal of diseases. In part, new substrates and enzymes for RIP3 implicate its involvement in many tissues but also its relative expression in cells feeds into their propensity to undergo necroptosis. 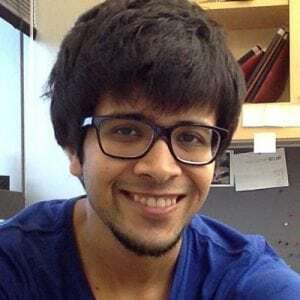 As a graduate student in the Cell and Molecular Biology program, Kartik is interested in understanding ways in which cells maintain a given pool of RIP3 by transcriptional and post-translational mechanisms. He is also interested in how diseases develop when RIP3 levels go awry. To ascertain how RIP3 expression is regulated, he utilizes in-vitro (cell-culture) and in-vivo (surgical) models of mainly vascular disease called abdominal aortic aneurysms where RIP3 was found to be necessary. When he is not studying murine-vasculature, you can find him reading papers over a cup of coffee or running on the Lakeshore Path along Mendota, putting into practical use the theoretical principles of a healthy cardiovascular system. He is the principal investigator on the pre-doctoral fellowship of the American Heart Association.